President shares details of historic meeting with North Korean leader, reveals terms of agreement signed after meeting. President Donald Trump addressed reporters Tuesday at a press conference following his historic meeting with North Korean dictator Kim Jong Un at the Capella Hotel in Sentosa, Singapore. 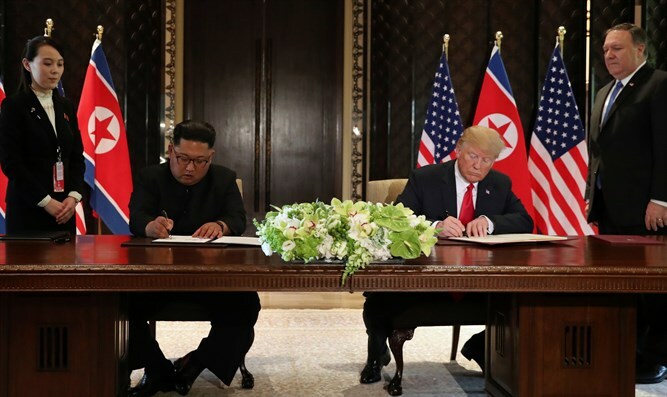 Following the 45-minute meeting, Trump and Kim sat down for a signing ceremony, putting their signatures to a document both sides described as “historic”, without revealing any details. Shortly after the signing, President Trump promised to reveal the nature of the agreement at today’s press conference. At the conference, Trump touted the signing of the agreement, saying it was the result of three months of negotiations between the US and North Korea, as well as 24 “tremendous” hours of work between the US and North Korean delegations since their arrival in Singapore for Tuesday’s summit. "We've had a tremendous 24 hours - really three months, since this has been going on for quite a while." North Korea, Trump said is ready to embrace its “tremendous” potential, and that Kim Jong Un was ready to “do what’s right”. "Is a great place, it has the potential to be an incredible place,” said Trump of North Korea. "It's got tremendous potential and I think he understands that and [Kim] wants to do what's right." Trump hailed the agreement signed with Kim as being “very comprehensive’, saying it was the product of “very intensive” work between himself and the North Korean dictator. "We spent very intensive hours together. The signed document is...very comprehensive. It is going to happen." "I stand before you as an emissary of the American people to deliver a message of hope and a vision of peace." "My meeting with Chairman Kim was honest, direct, and productive. We got to know each other very well in a very confined period of time under very strong, strong circumstances." "We are prepared to start a new history." The president also vowed to end the decades-old Korean War, which was suspended by an armistice in 1953, though never officially ended. "Nearly 70 years ago... an extremely bloody conflict ravaged the Korean Peninsula. Countless people died in the conflict, including tens of thousands of brave Americans. "Yet, while the armistice was agreed to, the war never ended. But now we can all have hope that it will soon end. And it will soon end. The past does not have to define the future. "As history has proven over and over again, adversaries can indeed become friends. We can honor the sacrifice of our forefathers by replacing the horrors of battle with the blessings of peace. That's what we are doing and that's what we have done." Turning to the contents of the agreement itself, the president said it included a commitment to achieve total denuclearization of Korea, with promises to pursue “vigorous negotiations” to that end. In terms of concrete steps towards that end, the president pointed to Pyongyang’s demolition of a ballistic missile testing site. "This isn't the past. This isn't another administration that never got it started and therefore never got it done. Chairman Kim has told me that North Korea is already destroying a major missile engine testing site. That isn't in the signed document - we agreed to that after the agreement was signed." Trump hinted that the North Korean leader had pledged to begin implementation of the agreement immediately upon his arrival back to Pyongyang. "I know for a fact that as soon as [Kim] arrives [back home], he's going to start a process that's going to make a lot of people very happy and very safe."